Author Garrard Conley opens up about creating Boy Erased and why we need to focus on survivors. To many of these incredulous onlookers, we survivors are time travelers — lonely souls from a barren land that would be better off seceding from the country. If I tell you that at one of my readings in New York City, a man pointed out the uptown clinic where his conversion therapist continues to operate; if I tell you that San Rafael, California, just 18 miles north of San Francisco, was where the conversion therapy clinic I attended got its start; if I tell you that I’ve received hundreds of letters from survivors all over the map — if I tell you this, will you admit that things are a little less tidy than you’d imagined, that none of us are truly safe? We survivors equal the population of Boston. Try picturing us in Boston, walking around, doing our shopping, searching for money, occasionally experiencing loss, occasionally experiencing happiness. We are here. When I first watched the film adaptation of my memoir, Boy Erased, in a private screening with the director and my husband, I, too, could hardly believe what I was seeing. 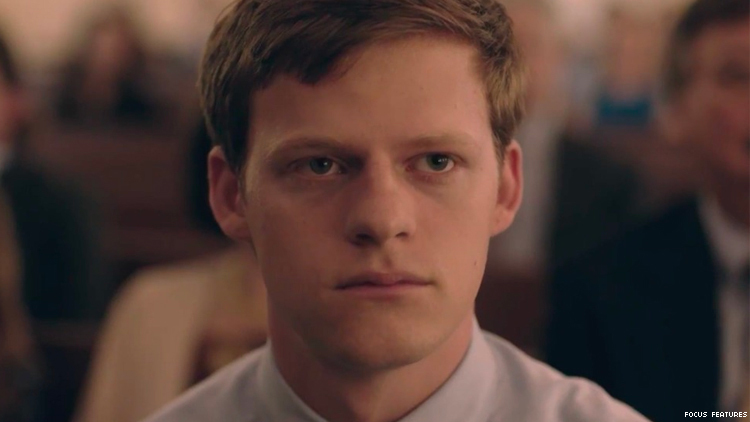 I was stunned and embarrassed to be the real-life counterpart to the boy Lucas Hedges was playing, not because his performance wasn’t accurate, but because it was too accurate — every wince, grimace, and forced smile was something I have tried for many years to put behind me. Without the retrospective voice of my memoir, without the queering of biblical texts, without the light dusting of homoeroticism over the whole conversion therapy farce, I was forced to see my experience of conversion therapy from the outside. Though I could see my husband was affected by the performances, I turned cold in that screening. I walked out with a strong determination to watch the film again only after enough time had passed for me to recognize that I would never again be that boy with no defenses. I did not last long. Other survivors soon asked me to sit with them in screenings, to help them relive the trauma. Matt Ashcroft, a Canadian survivor I interviewed after we met at a Toronto screening, told me why he felt it was important to document every blow. “I saw what I actually went through on film,” he said. “The question that [survivors] get the most is, ‘Is this a real thing?’ Now I don’t have to answer. I can show them this movie.” I have learned that, if I’m determined not to look away from other survivors’ suffering, I cannot look away from my own. Though I have no way of placing various forms of trauma on a scale, I can say that many survivor stories do not look like mine, and that the pain they’ve endured continues to shock me. In “The Ones Who Walk Away from Omelas,” an Ursula K. Le Guin short story, a town’s prosperity depends on the suffering of one child. As long as that one child suffers, the rest of the town can be happy. A few people decide this doesn’t sit right with them, and they walk away from Omelas. I’ve begun to think that this was not the best option, to walk away. Better to turn back and look at that child’s pain, to dismantle a town fueled by the enactment of trauma on the innocent. Besides, there is no walking away. Those people who walk away will find another dozen or so towns that come up with the same bright idea to torture a child for someone else’s benefit. You are never as far away from the torture as you might think. And it’s never just one child. Since we are talking numbers, our survivor numbers are, I imagine, much larger than reported. The people I grew up with do not tend to self-report. In the secret Facebook group I joined several years before writing my memoir, many of us admit to hiding our survivor status even from some of our closest friends. One major reason is that, until recently, the dominant narrative surrounding our stories has leaned heavily on the testimonies of our abusers. The first mainstream conversion therapy story I heard was in 2012 on This American Life and featured the voice of my abuser (who was also, admittedly, abused, being “ex-gay” himself). He worked in conversion therapy for 25 years. The radio show spent most of its time humanizing my abuser, and it featured zero voices from survivors of his torment. In fact, my abuser has appeared on Larry King, CNN, and Good Morning America. This year, I have been featured in many of these same outlets — a fact that’s not lost on me, and the knowledge of it surfaces a well of bitterness because I can name zero survivor appearances I witnessed during the decade of my recovery. Imagine all of us in the city of Boston, all 700,000 of us walking around, all completely silent. Then imagine all of us speaking at once, many of us yelling, some with megaphones. How deafening that would be. We roll up our sleeves and hike up our skirts and bear our scars for you. Imagine people turning away, plugging their ears — people in the very queer communities we have been trying to assimilate into after years, sometimes lifetimes, of pain. This has happened to me and many people like me. “No more sad queer stories,” they say. This year two major films were made about us: The Miseducation of Cameron Post and Boy Erased. The fight against conversion therapy has won major victories: mainstream media attention from places like People magazine, local TV reports debating bans on conversion therapy for minors, documents donated to the Smithsonian Museum of American History, and the American Psychological Association reiterating its opposition to conversion therapy for the first time since 1998. For the first time in many years, pro-conversion therapy conservatives seem to be truly afraid of the damage we’ve done to their image. You know what changed this year? We were asked to tell our unvarnished stories on our own terms. It’s as simple as that: the power of a story, one that people finally want to hear. “When your scars are visible, when you are stepping into hard work where we’re healing,” she said, “that isn’t the narrative of beauty, that isn’t the picture of marriage equality that the [queer] community likes to uphold and promote. We really just need to step through that. We have to hold it, create space for ourselves to be centered, and feel all of the feelings that come along with it, but move forward collectively.” We are not leaving this city. And now that we seem to have your attention, don’t you dare walk away. To read more, grab your own copy of Out's February issue featuring Hari Nef and and Tommy Dorfman as the cover on Kindle, Nook and Zinio today, and on newsstands January 22. Preview more of the issue here. Get a year's subscription for $19.95.